January :: 2014 starts with me continuing to work on my Home Poncho which I started just before Christmas 2013. February :: Bert is finished! February :: my Home Poncho is finished - Ta-dah! March :: my Rainbow Raindrops cushion is finished - Ta-dah! ....and a new chunky bag design. Both these patterns stayed on the back burner last year and still require a bit of tweaking and re-working, but I'm really looking forward to doing that very soon. April :: I made a Jolly Chunky Bag - Ta-dah! April :: my Coast Ripple blanket journey began. April :: Summer Blues bunting made for Simply Crochet magazine (I'll be sharing the pattern for this on my blog soon). April :: Mandala Madness took hold and I made these giant Starflower Mandalas. May :: more mandalas, with the launch of the creative project for Yarndale 2014. May :: Summer Blues Bunting in shades of pink this time. June :: my Coast Ripple blanket is finished - ta-dah! June :: I made a tiny Christmas bird decoration for Simply Crochet magazine. July :: I designed a "Rosy Cosy" jar cover pattern for the Yarndale brochure. July :: began making yarn signs for the Yarndale Yarnwalk. August :: finished the edging on my Cottage Ripple blanket - Ta-dah! August :: more yarn bomb crochet signs for Yarndale 2014. September :: making my starflower mandalas into dream-catcher hoops. September :: the final push to get everything made for Yarndale. October :: the Cosy Stripe blanket began. November :: the Cosy CAL started at the beginning of the month, with weekly progress updates. I worked 15 stripes each week. November :: started making the Cowl Neck Poncho. December :: made a woolly Christmas Card! December :: the Cowl Neck Poncho is finished - Ta-dah! December :: the Cosy Stripe blanket is finished - Ta-dah! ✿ I really enjoy putting these year end review posts together, mainly because it is always sich a pleasant surprise to see what comes up! My memory is really pretty bad so although I can remember the big blanket-sized things and the very most recent things, much of the other stuff I had completely forgotten about. 2014 was quite a challenging year for me on the hooky front as my general workload was very much bigger than ever before. I juggle my time between many different things these days, so don't have nearly as much time for crochet as I once had. But I try not to let that stop me and am constantly percolating ideas, mulling over new designs and stacking up things to try. Crochet really is at the centre of my life (well, maybe slightly to the right hand side of my mothering role) and is my passion, my relaxation, my social life, my therapy and my creative outlet. It never ceases to amaze me how the direction of my life changed on that Tuesday afternoon (August 2007) when I first picked up a hook. Amazing. This is my sixth annual crochet review, isn't that something? 1 0 0 0 th post. Thank you for all your inspiration and fabulous tutorials, I've learnt so much. I wondered if you had managed to put together a pattern for your beautiful chunky bag with the flower on the flap as seen in your blog post above? I've had it pinned to remind me to make it but not found a pattern? My resolution is to learn to crochet too. My lovely husband bought me a step by step guide for Christmas, let's see what happens! Your work is simply beautiful and your blog an inspiration. Happy New Year. Hi Lucy, as usual a fantastic catch up of things you have done during 2014. A few comments from some people infer your followers don't have a mind of their own to choose to buy magazines or yarn or contribute to Yarndale. Why do they comment if all they have to say is negative and is a form of bullying? They also have a choice either to read your blog or not but to leave unnecessary comments is a sad indication of today's cynical society. I hope, Lucy, that you carry on just as you are as we all love what you do and who you are and ignore the few sad comments that some leave on your blog. I contacted one of your followers in America and we agreed that you have a wonderful world wide (www) appeal and we feel a part of the extended Attic24 family. 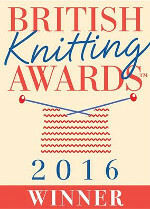 Much as expected - promotion of Yarndale and simply Crochet yet again. Expecting the "Home" round up to be the usual spending on unnecessary items, flowers and magazines. Oh wow, what a lovely blog and we all know you did much more than this. Well done I love all your projects and you get me out of my comfort zone and I am slowly trying more tricky patterns. You are an inspiration! Thank you for sharing your craft-filled life. My daughter introduced me to Attic24.....and now I'm hooked!!! Your use of colour is just so inspiring...and as a painter and tutor colour is my world! So looking forward to reading and seeing more of your wonderful designs. Congratulations on your 1000th post!!!! Happy New Year and you continue to bless me with so much creativity and the joy of colour and love of your family! Looking forward to another hooky year with you! I love your yearly review posts as well because they inspire me to get a wriggle on, and finish a swag of projects I've left by the wayside. The one lovely thing I noticed in your general year in review post after this one, is not just the wonderful things you have done and seen, but how the changes in light in each of the pictures reflects the changes in seasons. WOW!!! 1000! Every time I pop in to catch up you manage to amaze me in one way or another and this is no exception! Many congratulations on your 1000th post and here's to sharing the next 1000 with you! Happy New Year to you and your family. hope 2015 is good for you and yours. Happy New Year Lucy, congratulaions on your 1000th post and thank you so much for all the inspiration you give so freely. My Cosy blanket isn't quite finished yet - it's for a super king sized bed and I don't think it's long enough, so I'll be working on it for a while yet I think. You are one very talented lady Lucy! Happy New year to you and your family and thank you for all the inspiration in those 1000 posts. Lovely blog as usual Lucy, thank you for everything in 2014. What a wonderful year of crochet for you. Thank you for sharing your colorful creations and patterns! Congrats on the 1000th post and many more to come! :)) A lovely array of hooky goodness for the year with being so busy. I keep a crochet journal of my makes,my patterns, color combinations, ideas and such with notes about the specs of each project. I keep it near my "crochet chair" so it's handy to jot down things when I finish or think of something. Waiting with baited breath for that winter wreath ta-dah! I wish you a most creative and blissful 2015 and many many more lovely posts , sharing your makes with us. Congratulations on the 1000th blog post!! Love this round-up post, and all your posts throughout the year. Thank you for the cheer, creative inspiration, and fun!